We headed off to the Children's Wood (1) in Glasgow at the weekend to meet my BFF Euan for a picnic. If you haven't already been there it is well worth a visit - it is a magical place, filled with trees, veg beds, mud kitchens, tree houses, swings and all sorts of fun, natural things to play with. 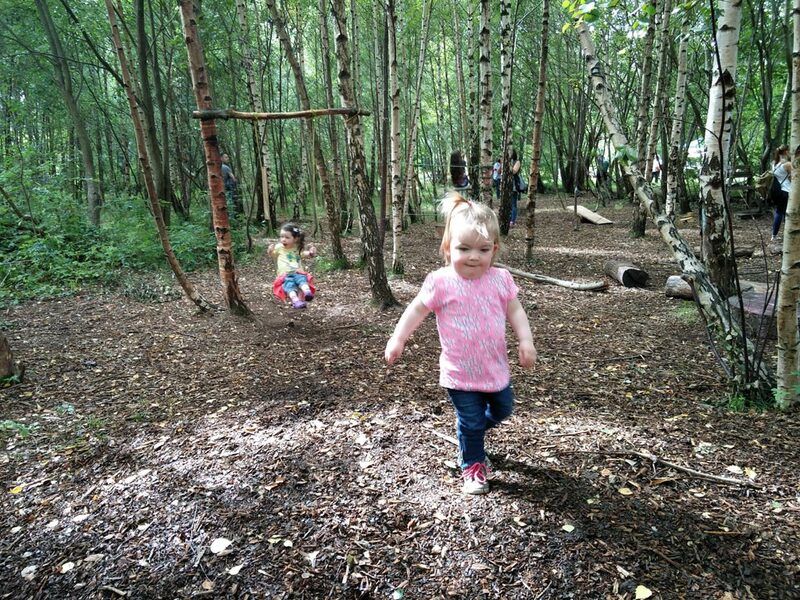 The perfect spot for playing and picnics! Two of my favourite things. It also inspired us to make our very own noughts & crosses game. 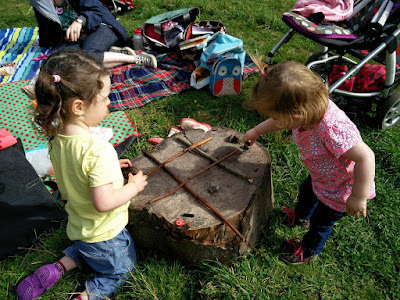 We found the perfect tree stump as a board, some twigs to make the grid and different coloured stones to use as markers. It was great fun! Tilda is pretty good at noughts & crosses! 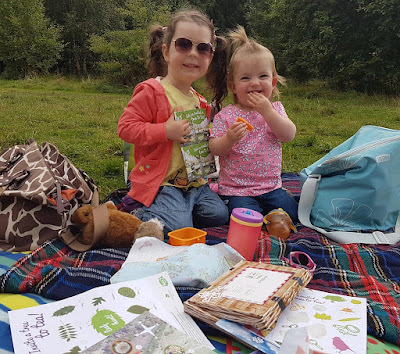 All this playing left us really hungry so it was time to raid the picnic and try out some new products which we had been sent. First were some wrappers from eco snack wrap. 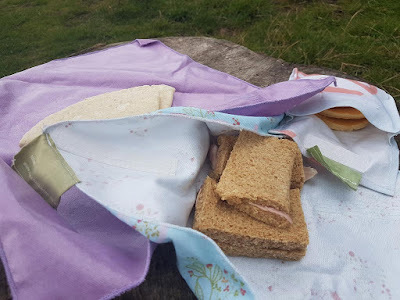 We had two sizes of sandwich wraps - a smaller size perfect for Tilda and me and a large one perfect for, yup you guessed it, Daddy! We also had a pouch which we popped some pancakes into. They are so much better than using sandwich bags or foil/cling film. Much better for the environment and they look so cute too. They come in a wide range of designs and prices start at £6.25. We definitely recommend them! 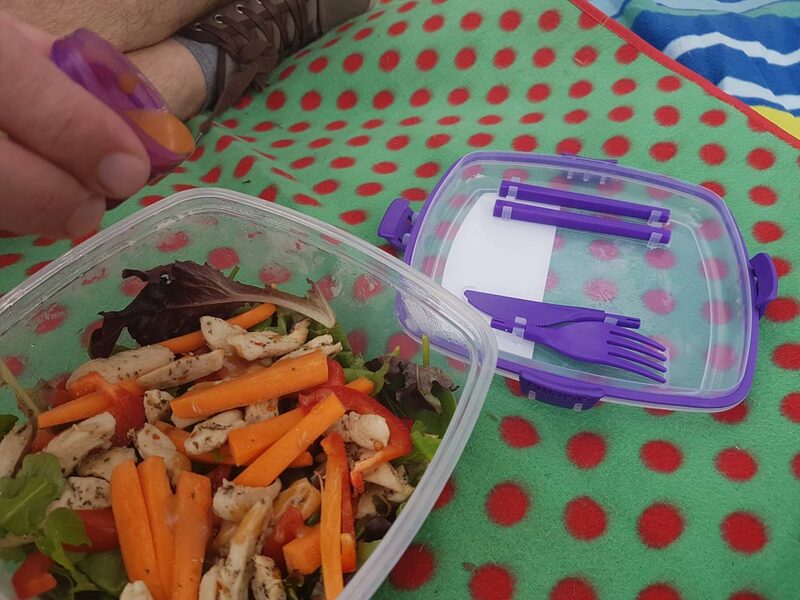 Daddy also tried out the Sistema Chill it to Go container which is an innovative tub for taking salads on the go. Basically, your salad goes in the main section, there is a neat cool box which fits neatly on the top and has a little hole where a pot for your salad dressing fits perfectly. There is even cutlery hiding in the top! Daddy's salad stayed perfectly chilled. No excuse for soggy, warm salads any more! The Sistema range is available in a wide range of supermarkets and shops from around £5.49. So get out there and make the most of the late summer sunshine and have a perfect picnic. 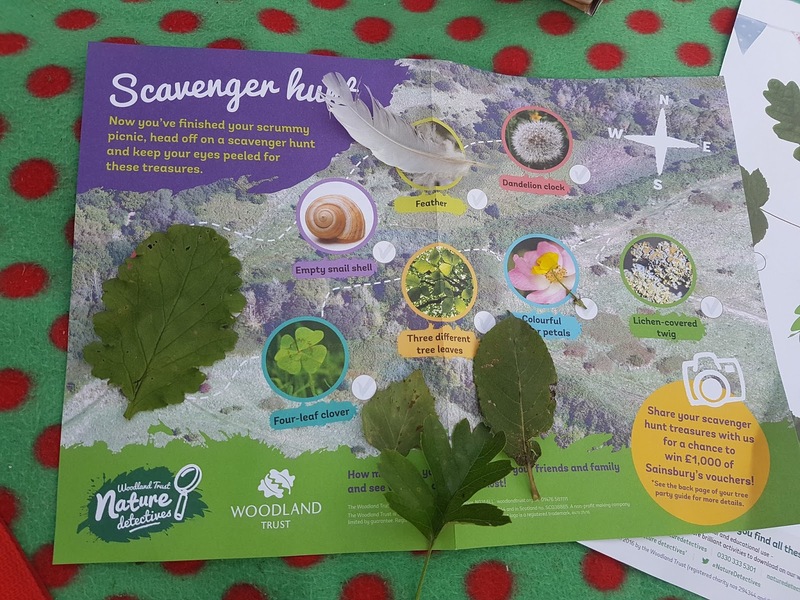 (1) Developers are wanting to build houses in this wonderful green space in Glasgow which would be a catastrophic loss to the many people of Glasgow who use the space (and visitors who come there to visit) and get to enjoy and learn about nature in its true setting. Please visit their website to learn more about this great cause and how you can help ensure it is there for future generations.